An examination of an entrepreneur who saw his personal wealth as a divine trust. Kathryn W. Kemp Can a rich man enter heaven? Asa Candler, who was a very rich man, thought so. He accepted the principle of Christian stewardship, which holds that God gives wealth to individuals in order to promote His kingdom on earth. Candler thus felt obligated to protect and build the fortune that he held as a sacred trust, and to use it to carry out God's purposes in the world. 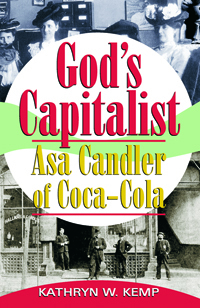 God's Capitalist: Asa Candler of Coca-Cola is an examination of the life of an entrepreneur who saw his personal wealth as a divine trust to be used to the benefit of humanity. Today, people remember Asa Candler for his part in founding The Coca-Cola company and beginning that product’s phenomenal success, but he also was successful in real estate development and in banking. His interests made him one of the richest men in the early twentieth-century South. His sense of duty led to his support of many undertakings of the Southern Methodist Church. Advised by his brother Warren, a Bishop in that denomination, Asa wrote a million dollar check to finance the establishment of the Emory University in Atlanta, where young men would be prepared for the ministry. Throughout his life, Candler made gifts and loans to encourage the well-being of his denomination, his city, and his state. At the end of his life, he had given away his entire fortune. Despite his wealth and reputation, he was opposed by those who did not share his point of view, which was primarily shaped by his religion and his social position among Atlanta's elite. The last decade of his life was filled with sadness and difficulties, as he mourned the loss of his beloved wife and fought numerous court battles. By following Asa Candler's life, readers have a unique opportunity to visit Atlanta during one of the most critical times in its development, and to see it through the eyes of one of Atlanta's "movers and shakers".